The average lifespan of most electronic gadgets has been persistently sinking. Fast obsolescence of electronic gadgets has become one of the major factors leading to the generation of electronic waste. The electronic items which have reached end-of-life for the user are termed as e-waste. These items contain materials that have high value but at the same time, they can lead to environmental risks if they are land filled or incinerated. This report is based on an in-depth research study on the e-waste management market, on the bases of the material recovered after recycling and the source of these materials for e-waste. Among the total solid waste generated globally, e-waste has a good share which is required to be treated properly to avoid the ill effects on the environment and human health. The report has estimated that household appliances among all the sources of e-waste generation have the major share. The e-waste recyclers and institutions working for the e-waste management are also encouraged by the government rules and regulations to come up with the advanced technological advancements of the recycling methods in developing nations. The report targets these recycling companies in the market. The report provides the profiles of the major active companies in the e-waste management market. The recent developments, adoption of technologies, and agreements to strengthen the growth of this market are also briefly discussed. The report provides the competitive landscape of the key players which indicates their growth strategies in terms of the market. The report also presents E-Waste Management Market dynamics such as the drivers, restraints, opportunities, and challenges. Apart from the in-depth view on the market segmentation, the report also includes the critical market data and qualitative information for each type, along with the qualitative analysis such as the Porter’s five forces analysis, value chain analysis, and market breakdown analysis. The e-waste management market was worth USD 1.66 Billion in 2014 and is estimated to grow at a CAGR of 20.6% between 2015 and 2020. The largest source of e-waste generated is through household appliances and the largest material recycled is metal, followed by plastic. The e-waste management market segmented on the basis of material recovery includes metals, plastic, glass, and others including material recovered from PCBs, wood, and ceramics. The e-waste management market segmented on the basis of source type is categorized into household appliances, IT & Telecommunications, entertainment and consumer electronics, and others including medical equipment, toys, and lighting equipment. The e-waste management market segmented on the basis of geography is divided into the Americas, Europe, Asia-Pacific, and the Rest of the World (RoW); the regional analysis is further carried out on the basis of countries. 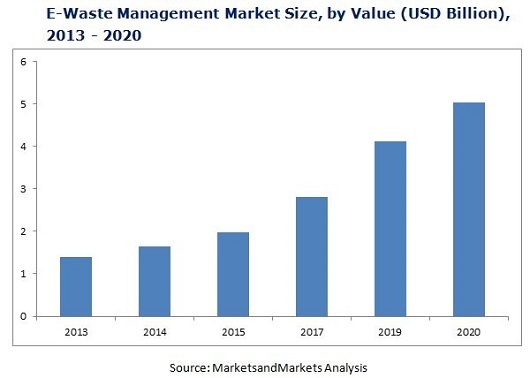 The major players in this e-waste management market include Aurubis AG (Germany), Boliden AB (Sweden), MBA Polymers, Inc. (California), Electronic Recyclers International, Inc. (U.S.), Sims Metal Management Ltd. (Australia), Umicore S.A. (Belgium), Stena Technoworld AB (Sweden), Tetronics (International) Ltd. (U.K.), Enviro-Hub Holdings Ltd. (Singapore), and Global Electric Electronic Processing Inc. (Canada). The typical life cycle of an electronic product goes through the phases like, introduction, growth, maturity, and disposal or recycling. An electronic product reaches to the recycle stage either because of end of its life cycle or technology advancements, or even owing to the changing requirements of consumers. The technology advancement is resulted in the new product development which is replacing the old technological products. People are following the trend of replacing old products with technically advanced products which leads to the generation of a huge e-waste market. The global e-waste management market size is projected to reach USD 5.04 Billion till 2020 at an estimated CAGR of 20.6% between 2015 and 2020 from USD 1.66 Million in 2014. The whole value chain in the e-waste management consists of source for e-waste, collection process , recycling, and recovered material for sales. In the recycling process of e-waste, the materials such as copper, aluminum, gold, silver, plastic, glass, and many others can be extracted. These recycled products/materials are again utilized for the manufacturing of electronic and non-electronic products. The report summarizes the generation of e-waste across the world, in terms of volume, on basis of different types of sources of e-waste and the volume and value of the total e-waste recycled out of the total e-waste generated. The material recovered from e-waste by using different recycling techniques to make the e-waste management more effective and avoid the hazardous effects that may occur due to the improper treatment of waste like landfilling and incineration. The e-waste management market size is expected to grow at a CAGR of 20.6% between 2015 and 2020, from the market size of USD 1.66 Billion in 2014. This report focuses on the detailed segmentation of the market, combined with the qualitative and quantitative analysis of each and every aspect of the classification on the basis of materials recovered, source types, and geographies. All the numbers, at every level of detail, are estimated till 2020 to give a glimpse of the potential market size in terms of value in this market. Figure 74 SWOT Analysis: Electronic Recyclers International, Inc. Figure 78 SWOT Analysis: Umicore S.A.